Archeological digs in northern India, dating around 3,500 B.C., have uncovered a seal, used to sign documents. The seal shows a procession of seven men carrying square standards, held aloft on poles like modem flags. While these ancient flags were rigid, like boards, and not made of cloth as modern flags are, they provided ample testimony that heraldry and the displaying of banners dated to the earliest civilizations. It is only natural, therefore, that America should create colonial flags as soon as the first colonists settled. Given the disparate array of settlers, it is not surprising that a wide variety of flags was created. The first flags adopted by our colonial forebears were symbolic of their struggles with the wilderness of the new land. Beavers, pine trees, rattlesnakes, anchors and various other insignia were affixed to different banners with mottoes such as "Hope," "Liberty," "Appeal to Heaven," or "Don't Tread on Me." In the early days of the Revolution, there were colonial and regimental flags by the score. The Boston Liberty flag, consisting of nine alternate red and white horizontal stripes, flew over the Liberty Tree, a fine old elm in Hanover Square in Boston, where the Sons of Liberty met. Still another was a white flag with a green pine tree and the inscription, "An Appeal to Heaven." This particular flag became familiar on the seas as the ensign of the cruisers commissioned by General Washington, and was noted by many English newspapers of the time. Flags with a rattlesnake theme also gained increasing prestige with colonists. 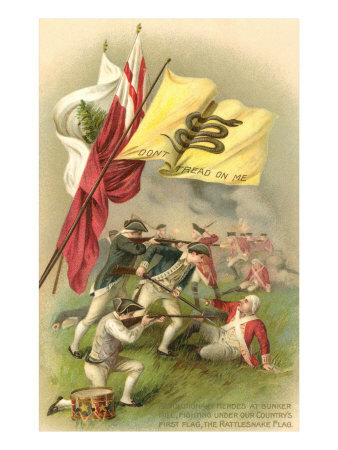 The slogan "Don't Tread on Me" almost invariably appeared on rattlesnake flags. A flag of this type was the standard of the South Carolina Navy. Another, the Gadsden flag, consisted of a yellow field with a rattlesnake in a spiral coil, poised to strike, in the center. Below the snake was the motto, "Don't Tread on Me." Similar was the Culpepper flag, banner of the Minutemen of Culpepper (now spelled Culpeper) County, Virginia. It consisted of a white field with -a rattlesnake in a spiral coil in the center. Above the rattlesnake was the legend "The Culpepper Minute Men" and below, the motto, "Liberty or Death" as well as "Don't Tread on Me." "I recollected that her eye excelled in brightness that of any other animal, and that she has no eye-lids. She may, therefore, be esteemed an emblem of vigilance. She never begins an attack, nor, when once engaged, ever surrenders. She is, therefore, an emblem of magnanimity and true courage. It was probably the deadly bite of the rattler, however, which was foremost in the minds of its designers, and the threatening slogan "Don't Tread on Me" added further significance to the design. The Moultrie flag was the first distinctive American flag displayed in the South. It flew over the ramparts of the fort on Sullivan's Island, which lies in the channel leading to Charleston, South Carolina, when the British fleet attacked on June 28, 1776. The British ships bombarded the fort for 10 hours. But the garrison, consisting of some 375 regulars -and a few militia, under the command of Col. William Moultrie, put up such a gallant defense that the British were forced to withdraw under cover of darkness. This victory saved the southern Colonies from invasion for another two years. The flag was blue, as were the uniforms of the men of the garrison, and it bore a white crescent in the upper corner next to the staff, like the silver crescents the men wore on their caps, inscribed with the words "Liberty or Death." The Maritime Colony of Rhode Island had its own flag, which was carried at Brandywine, Trenton, and Yorktown. It bore an anchor, 13 stars, and the word "Hope." Its white stars in a blue field are believed by many to have influenced the design of our national flag.